Rapidly dissolves or breaks up all forms of graffiti. The strong solvent action works on felt tip, ball point, crayon, spray paint (cellulose, acrylic or polyurethane). 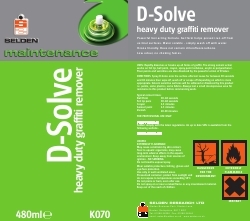 Floor paints and varnishes are also dissolved by the powerful action of D-Solve. Composition Water dispersable organic solvents, natural citrus oils, thickeners and stabilisers.